Here is a little promotion about my home town. The location of the health resort Ratzeburg is in the southeast of the state Schleswig-Holstein inside the nature reserve Naturpark Lauenburgische Seen and nearby the state border to Mecklenburg-Vorpommern. Ratzeburg, quite close to the medieval trade route Old Salt Route (german: Alte Salzstrasse), is the chief town of the district Herzogtum Lauenburg. Three routes linking the island with the mainland. 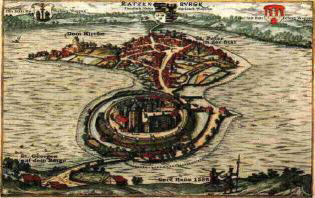 Ratzeburg was founded 1062 as Racisburg. The name Ratzeburg is traditionally derived from the local slavic Prince Ratibor (nicknamed Ratse). Henry the Lion became the ruler of the town in 1143 and established a bishopric in 1154. A view of the island city and the four lakes. In front on the left the lake Grosser Ratzeburger See (length 10km). And in clockwise direction the Domsee, Kleiner Küchensee and Grosser Küchensee. The four lakes (Grosser Ratzeburger See, Domsee, Grosser Küchensee, Kleiner Küchensee) around the city, as well as the densely wooded area, inviting for various recreational activities. Sailing, windsurfing, rowing, jogging and hiking are some of the popularly sporting activities around Ratzeburg. The annual Dragon boat races, the international rowing race and the medieval market Racesburg Wylag are further special attractions. Super Sache für mich als GUI-Designer. Danke!